1 Caption: Have you ever seen a magician pull a tablecloth out from under dishes and the dishes stay put? This "trick" demonstrates the law of inertia. 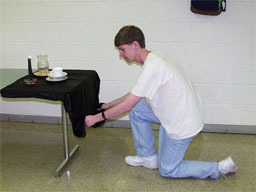 Since the dishes have inertia, they stay put and only the tablecloth moves because the force (the pull) is only applied to the tablecloth, not the dishes. 2 There are some things in science that have been found to be always true. They are known as laws of science. Governments have laws, too. A law made by a government tells what should happen. Laws tell people what they should do. 3 If someone doesn't like a law of government, he might break it. That would probably get him into trouble, but laws of government can be broken. Laws of government can also be changed. If enough people don't like a law, they can ask their government to change the law. Laws of science cannot be changed or broken.